* For reasons I have not yet figured out, this movie is called Dead Men Tell No Tales in the US but over here in Malaysia, they’ve gone with Salazar’s Revenge. While I like the sound of Dead Men Tell No Tales as the title of a pirate-themed movie, after watching it I think Salazar’s Revenge is probably better. Jack Sparrow apparently has a neverending list of people who hate him. This time it’s a Spanish naval officer named Captain Salazar (Javier Bardem), who has been condemned to an undead life after Jack trapped him in the Devil’s Triangle. Will Turner’s son, Henry (Brenton Thwaites), is seeking Jack as well. He thinks Jack Sparrow can help him find the Trident of Poseidon, which can purportedly control the seas and break any curse – such as the one binding Will to the Flying Dutchman. 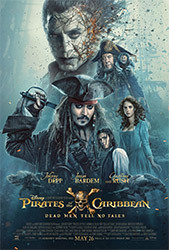 Jack and Henry end up with two more new friends in Carina Smyth (Kaya Scodelario), a scientifically-minded woman who knows how to locate the Trident, and Captain Barbossa. Definitely better than the previous movie (On Stranger Tides). I recall nothing about that movie except that there was a mermaid and a young missionary, and that at the end of it the missionary went down into the sea with the mermaid. This lack of memory was a bit of a problem because it meant that I had no idea why the Black Pearl was sitting in a bottle that Jack carried around. It was puzzling, but didn’t disrupt the overall experience too much. It amused me to see Barbossa in his ostentatious ship. I’m almost disappointed there wasn’t more of it. I really enjoyed seeing Will and Elizabeth again. I am definitely disappointed there weren’t more of them. I think I forgot how much I enjoyed those two characters. Jack Sparrow’s presence is rather overpowering, but I did like Will and Elizabeth. They were fun foils to Jack’s kookiness and were endearing in themselves. Did not like the twist that Carina is Barbossa’s daughter. I get it – they needed to add dimension to Barbossa. They probably wanted to make him more sympathetic and to justify how he meets his end in the movie. But it just felt so unnecessary. Did he have to go all self-sacrificial like that? All these movies have run on Jack Sparrow’s unbelievable ability to turn the tide in his favour at crucial moments. Surely they could have come up with something of the sort here. They should have done away with the stupid subplot about the witch and the navy trying to track Jack and Henry down. That went nowhere since Salazar & co. popped up and smashed the navy ship in one go. That would have shaved off some screentime. The movie was decent enough that while watching I didn’t find myself thinking much about plot holes. But upon reflection, there are quite a few. Where did Henry get the silver to pay Jack’s former crew? How did 10-year-old Henry figure out how to find the Flying Dutchman in the middle of the sea in the first place? I suspect there are a whole lot of in-universe discrepancies and plot holes that I don’t recognise because I just forgot the content of POTC4, and it’s been a long time since I watched 2 and 3… But I do seem to recall that Jack gave the compass away at least once before this. Why does the compass consider this a betrayal and not prior instances? I spent half the movie thinking that Kaya Scodelario looks like Kate Beckinsale. And the other half realising that she looks like Nicole Kidman too (from the front). So I conclude that she looks like a mixture of Kate Beckinsale and Nicole Kidman. Hang on. Isn’t Will’s father – Bootstrap Bill – still alive? If all the curses are broken, shouldn’t he have shown up at the end too? Geoff Zanelli handled the music here, but I think the themes that stood out the most were the original ones that made appearances throughout the movie. I don’t even think he changed them? It sounded to my inexperienced ears exactly like the original themes. I can’t decide if I like or dislike the post-credits scene! I really liked just seeing Will and Elizabeth peacefully sleeping in bed together. I also liked Will waking up from his “nightmare” and protectively embracing the still-sleeping Elizabeth. I did not like the suggestion that Davy Jones has somehow returned and can now walk on land… Come on, end the series here, Disney. It’s a nice way to close it. I think I would have really liked this movie if it had been more heavily centered on Henry and his quest to save his father. Or, better still, if the movie had been about Henry and Elizabeth going to find this Trident and running into Jack along the way. It kind of started out as being centered on that, but very quickly got swayed to the Salazar storyline and that took over completely. The one thing that Will Turner as a character had over all the others (Henry, Elizabeth, Carina, etc.) is that he really made Jack Sparrow a more rounded character instead of a one-dimensional wisecracking, selfish pirate. They start off as enemies (Will tries to kill Jack when he first meets him in his blacksmith’s workshop) and end up as friends (Will saves Jack from the gallows at the end of POTC1). Their friendship is rather rocky and confusing at times throughout POTC2 and 3, but at the end of 3 Jack chooses to save Will by letting him take Davy Jones’ place instead of doing so himself. That one act allowed Jack’s good side to come out, and made for a nice rounding-off of a friendship that started out as the complete opposite in POTC1. What I think has happened since the third movie is that Jack’s selfishness has been allowed to take over. His motivations have always been extremely self-centered, but he seemed to have a tiny soft spot for Will Turner and Elizabeth Swann (even if he did recoil at finding out Henry’s their “spawn”), which made him a lot more bearable. It’s like how Pepper Potts makes Tony Stark more appealing to viewers. But in the fourth movie, Jack simply didn’t have the same rapport with the Will and Elizabeth replacements. So it didn’t sit as well with viewers. Perhaps in this fifth movie, they should have emphasized Jack’s friendship with Will much more. Instead it came across as Jack wanting the Trident so he could take over the seas and regain his glory again, instead of really wanting to help Henry break the curse of the Flying Dutchman. So while I did enjoy this movie, I think there was a missed opportunity here to have really put it on par with the original movie. In fact, it might have been a good idea to view the Pirates of the Caribbean series of movies as the story of Will and Elizabeth and Captain Jack Sparrow. Jack is there to facilitate the story of Will and Elizabeth. So if the fourth and fifth movies had been about the attempt to free Will from the Dutchman, and if it had concluded here in the fifth movie with that happy ending, I think the series as a whole would have been hugely improved. Note: I went back to my review on POTC4. Apparently I said it could be considered almost equal to POTC2. HAHAHA As if. I guess that was my first impression. Six years later, I don’t remember 98% of that movie but I can still recall a good deal of the first movie and fair amounts of the second and third. Will this movie hold up six years later? Or will I have changed my mind? We shall see.